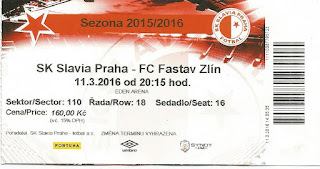 Slavia Praha is a famous football club from the Czech capital of Prague which was formed on the 2nd November 1892, as ACOS (Akademický cyklistický odbor Slavia), by medical students in the Vinohrady district of the city. The club was formed to promote all sports, becoming SK Slavia Praha in 1903, with cycling originally taking prominence before football was introduced in 1896 playing initially at the Imperial Meadow, before moving to Letenskou pláň (Letná Park) the following year. Scotsman and former Celtic player John Madden arrived to revolutionise the club in 1905, bringing tactical knowhow from his home country, by which time Slavia had already won the fledgling Czech Championship in 1897 spring, 1897 fall, 1898, 1899, 1900 and 1901. Madden went on to put in place strong foundations that would set up the club for a golden period following his retirement in 1930. While no official championship was held during most of his reign, the side won the majority of its games against domestic and international opponents. He did oversee the Czech: 1. fotbalová liga (Czechoslovak First Division) title wins of 1925, 1928–29 and 1929–30. 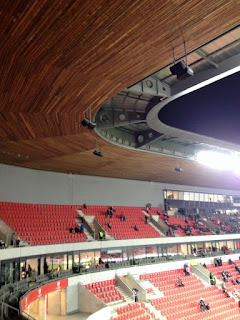 At the same time Letná was improved and made into a top class venue. New boss Josef Štaplík carried on the good work as Slavia collected further championships in 1930–31 and 1932–33 before Kálmán Konrád took over and added the 1933–34 and 1934–35 titles to the list of honour. Such was the stature of the Slavia side of the day, that it provided eleven of the Czechoslovakia squad, where the team reached the final, losing 2-1 to Italy at the 1934 World Cup; Štefan Čambal, František Junek, Vlastimil Kopecký, Rudolf Krčil, František Plánička (captain), Antonín Puč, Adolf Šimperský, Jiří Sobotka, František Svoboda, Antonín Vodička and Ladislav Ženíšek. Another couple of league titles were collected in 1936–37 and 1939–40 before the arrival of Austrian Josef Bican heralded the beginning of a second golden period at Eden. League titles followed in 1940–41, 1941–42, 1942–43 and 1946–47. The introduction of the Pohár FAČR (Czech Cup) also brought silverware to the club. In 1941 big rivals Sparta were defeated 8-6 on aggregate in the final. The trophy was retained the following year thanks to a 10-7 two legged victory over future neighbours Bohemians. The two matches in the 1945 final culminated in a 6-3 win for Slavia over Rakovník. 1948 saw a name change, with the club being retitled Sokol Slavia Praha. A year later they became, ZSJ Dynamo Slavia Praha under the ruling Soviet authorities, who also decided that they wanted Letná to be remodelled with a monument in tribute to Stalin. 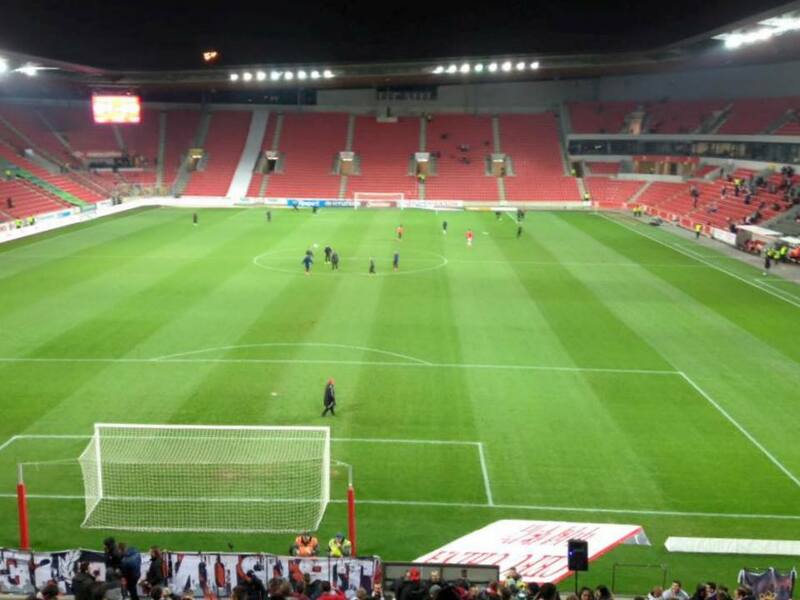 The final game at the old stadium was on the 3rd December 1950 against OP Praha. The club were given compensation and searched for a new site, finally settling on the site of a former pond in Vrsovice to the south of the city. The opening game at Eden in the new 38,000 capacity ended with a 1-1 draw with Olomouc on the 27th September 1953. Fittingly it was a forty year old Josef Bican who scored the first goal at Eden for the club now known as DSO Dynamo Praha under their latest change. 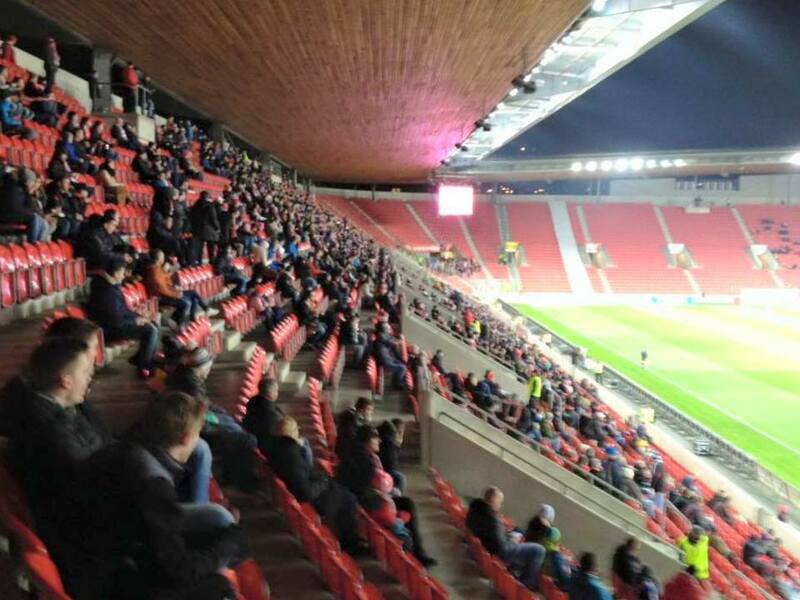 These were hard times for Slavia as the rules insisted that players represented their employees and state teams. Private sports clubs suffered enormously throughout this period. In 1954 the club became known as TJ Dynamo Praha. The team struggled in the ensuing years and were relegated to Czech 2. liga at the end of the 1960-61 season. The team went straight back up, but were sent to the second tier once again in May 1963. Another name change, this time to their traditional SK Slavia Praha, brought the luck that was needed in 1965 as the club returned to the top flight. By 1973 Eden was a tired venue and there were suggestions of moving to a new stadium. 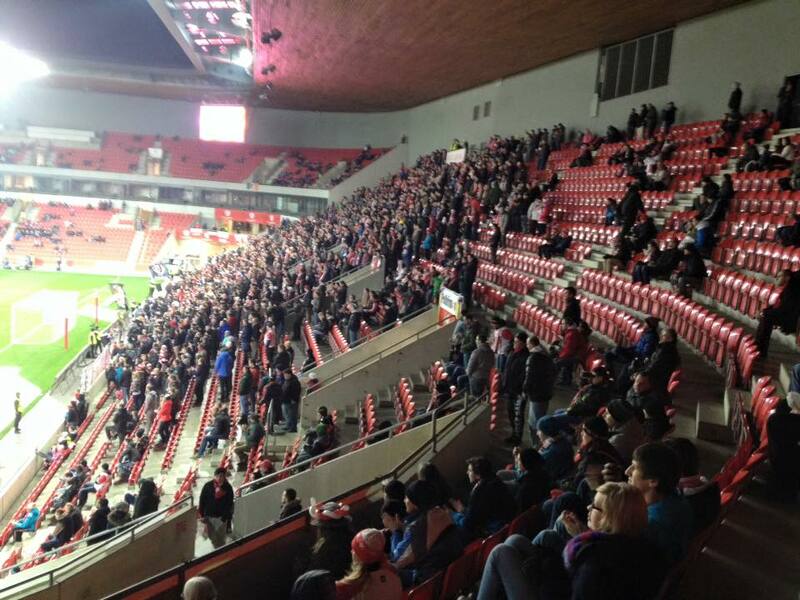 As a compromise it was suggested to rebuild the stands. In 1973 another alteration to the title occurred as TJ Slavia Praha. A year later a barren spell of twenty nine years without a major trophy came to an end as the Pohár was lifted with a penalty shoot out victory over Slovan Bratislava after the sides had drawn 1-1 on aggregate. That would be the final trophy to return to the old Eden. Its East Stand was demolished in 1989, and following extended wrangling over finances, construction and bills, Eden closed its doors for the last time on May 13th 2000 following a 4-1 victory against Ceske Budejovice, with the final goal being scored by Pavel Horváth. 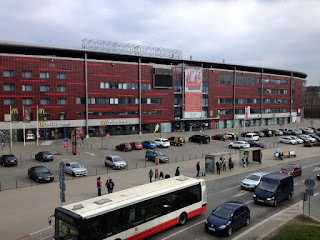 Červenobílí (the red and whites) decamped to Strahov hill to play in the Stadion Evžena Rošického. The club was bought by Tottenham Hotspur owners, ENIC Group, as investment into the team paid dividends on the field. In 1995-96 František Cipro’s side won the Czech Liga, going on to lift the Pohár FAČR the following season as Dukla Prague were defeated 1-0 at Strahov thanks to Karel Vácha’s extra time goal. The successes brought European competition to the club the memorable ties against AS Roma, Arsenal and Sevilla amongst others. The 1996 Czech Republic Euro Championships squad included Jan Suchopárek, Karel Poborský, Radek Bejbl, Vladimír Šmicer and Pavel Novotný of Slavia. 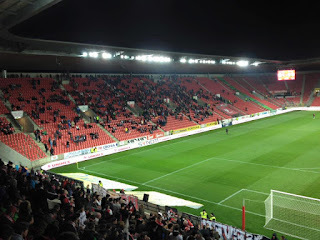 Further Pohár’s were lifted in 1999, where a lone Horváth extra time goal defeated Slovan Liberec and in 2002 as a brace from Tomáš Došek helped Slavia defeat Sparta 2-1. 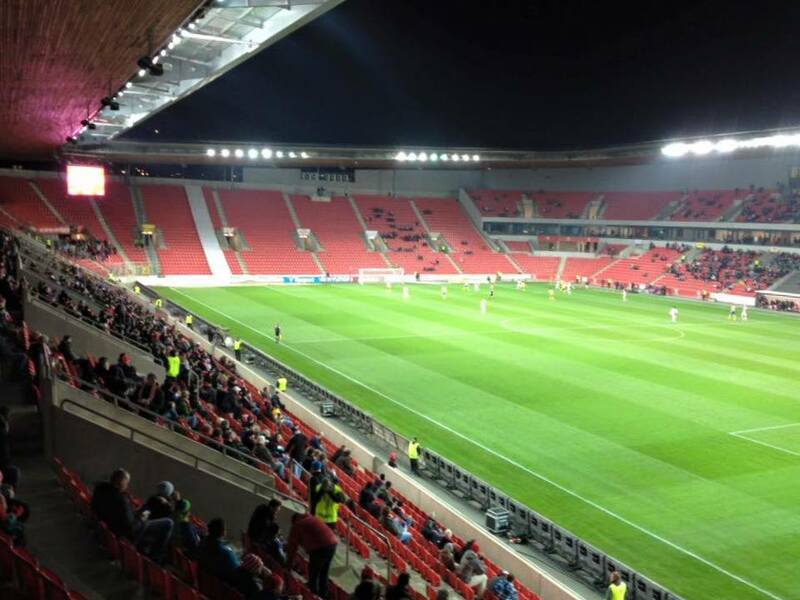 Finally construction began on a new Eden Arena began in 2006, with the opening match against Oxford University ending in a 5-0 win with Šmicer scoring the first goal in the new 20,800 capacity stadium. Under Head Coach Karel Jarolím, Slavia won back to back league titles in 2007–08 and 2008–09. 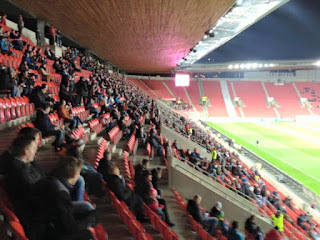 However they were dispatched in the preliminary rounds of the Champions League by Fiorentina and then Sheriff Tiraspol. This led to a deep financial crisis at the club. 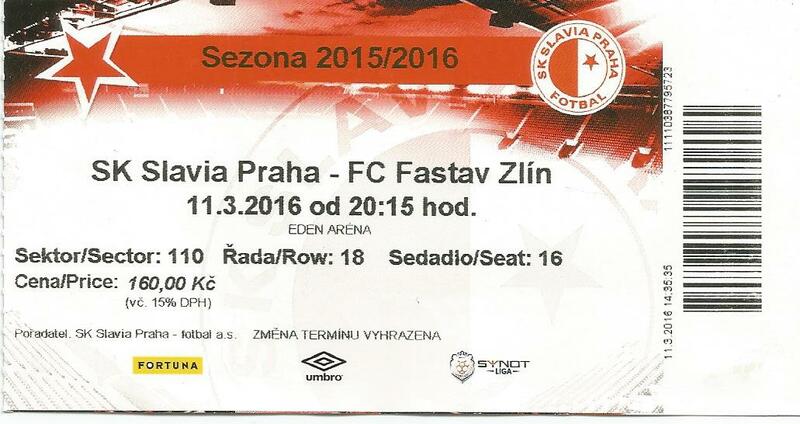 ENIC had earlier sold Slavia to Czech brokers, Key Investments. They had in turn spent money on the club rather than meeting their payments to the former owners. Players were sold and the wage bill slashed. 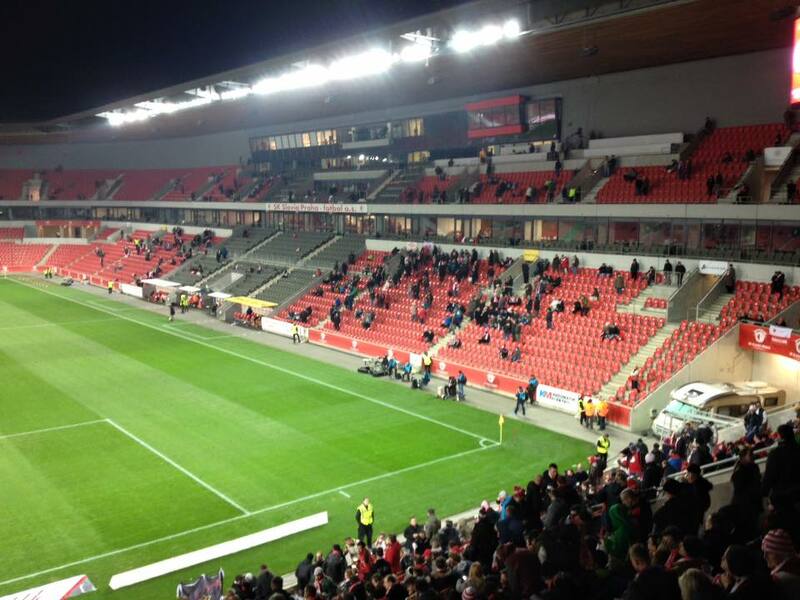 The loyal Slavia fans were not especially taken by this development; going on to cause the cancellation of the Pohár semi-final against SK Sigma Olomouc in 2011. To put salt into the wounds, Slavia lost the tie 4-0 on aggregate when it was eventually played. In September 2015 the club was bought by CEFC China Energy Company, with the side going on to a fifth place finish and a Europa League finish under the stewardship of Dušan Uhrin, Jr. Their run lasted until the third qualifying round where they went to the Portuguese Rio Ave.
SK Slavia Praha will play in the Czech Liga in the 2017-18 season. 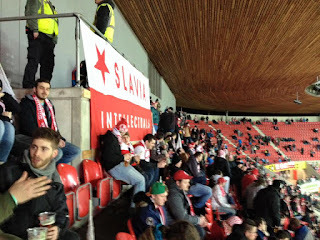 When I booked my Prague long weekend I was delighted to see that Slavia were chosen as the designated Friday night live TV game on the first week back after the winter break. 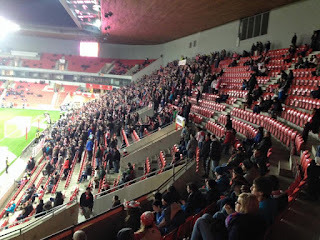 I’d called at the Eden Arena during the afternoon to buy my match ticket as I had been for a look at near neighbours Bohemians and to save time later. I’d made a note to myself to definitely take the bus. Parts of the main road; Vršovická were dug up to improve the tram link. This led to me taking rather an elongated but probably needed walk back to my digs in time for a siesta before heading out again. I left Hotel Golden City Garni on a cold but dry evening and walked to the Rokycanova stop just around the corner. The 136 bus dropped me right outside Eden and with time for a welcome couple of fine beers inside the supporters bar. 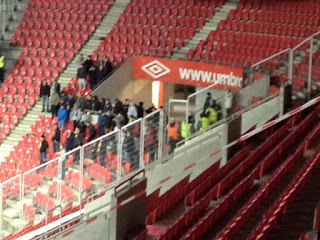 After buying a programme I went inside the stadium. 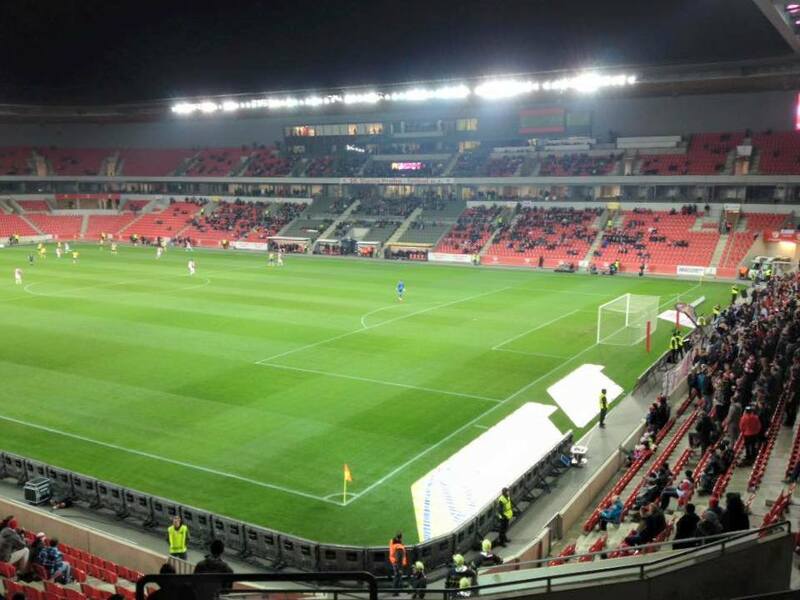 Eden Arena was impressive and ideal for a stadium capable of staging international as well as club football. The arena was a single tiered bowl aside from the main side, with the roof wrapped around. 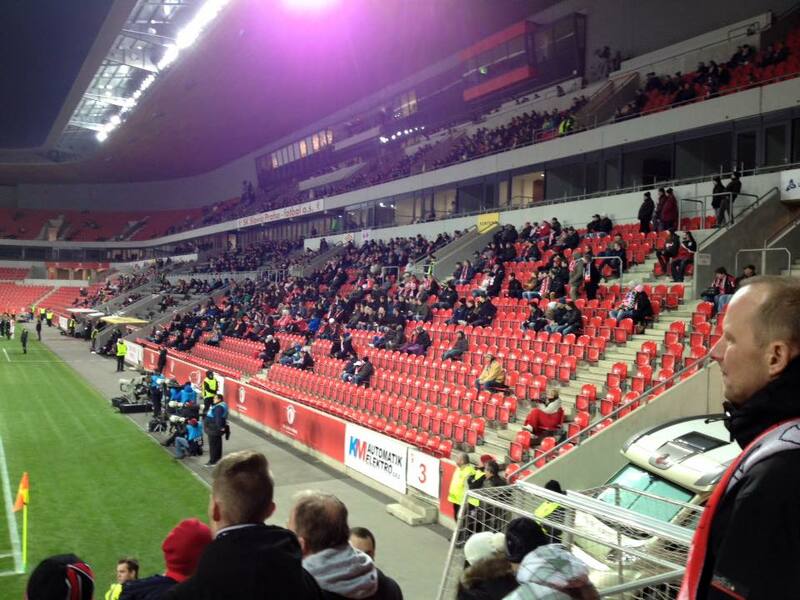 The stadium was all seated, with the main side having corporate facilities. Once I’d bought another beer inside along with one of the spiciest sausages I’d ever bought I went upstairs. Seats were available in most areas and although I began the night in my intended place, I watched from various points through the match. 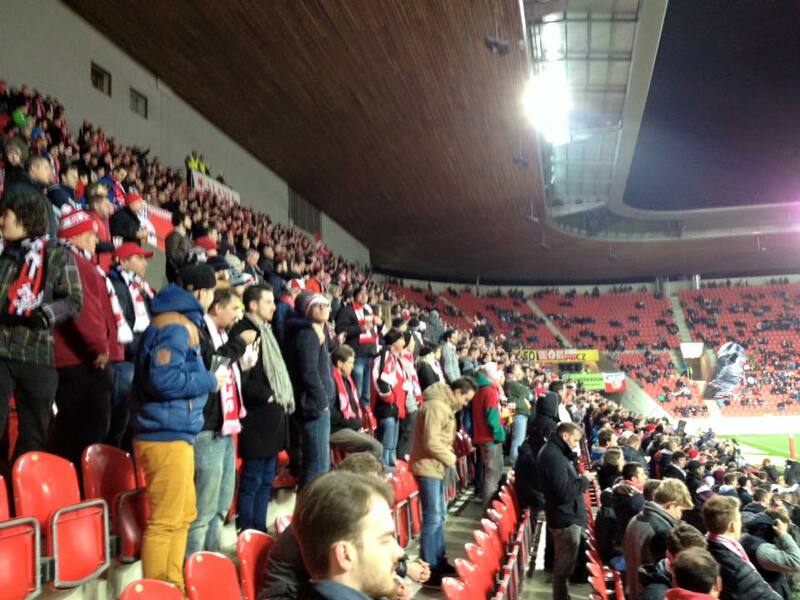 Sparta began the game in fifth place, with the visitors of Zlín in tenth. The home side were without the aid of their coach, as Mr Uhrin had spoken out of turn during a previous game. 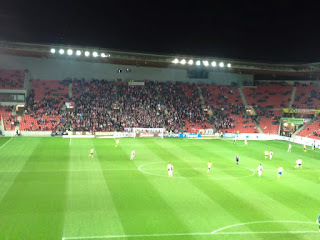 The teams came out with Slavia kicking towards their fans in the first half. Around thirty travellers had turned up to cheer on Zlín. It took the home side just six minutes to go into the lead as Tomáš Souček powered home a header from a corner. The way the game started I wondered if I could be about to see a high score? However, it was not to be. Zlín were not there just to make up the numbers and they came into the game, after Diop had an effort blocked. Slavia’s Levan Kenia hit the crossbar, but nothing too much more happened of note until the interval. I had a wander round the rear of the VIP side to take some photos from the other end. 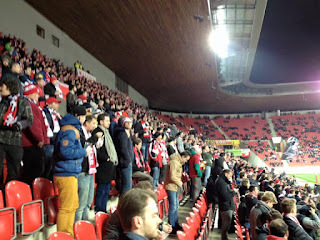 My lips were still slightly warm from the pre match banger; yet there were locals smothering them in mustard! It’s fair to say that the sausage was up there as a major talking point of the match as it drifted along, with neither side really looking like changing the scoreline. It wasn’t very inspiring stuff, and certainly didn’t match the fine setting. It didn’t take me long to decide to beat the crowds and make a run for it once the additional minute board was displayed. A return 136 bus turned up promptly, which was handy to get away before the traffic built. I alighted at Orionka because I had been given a tip by some friendly locals the previous Thursday. Vinohradský pivovar was indeed a fine brewery bar, with a very modern touch. It took me a while to suss out how to get served, but I was soon sorted as I tried a couple of their fine products. Next up was a walk over the brow of the hill near to Žižkov Television Tower to another recommendation; Hostinec U Vodoucha. The young lady announced that they’d finished serving food as I approached but I was fine if I just wanted beer. I enjoyed three or four from the beer menu, using google translate on my phone for descriptions. After a couple of nightcaps in the seemingly twenty four hour bar on the corner of Lipanská and Táboritská and a kebab I went to bed a contented and full traveller, ready for an early kick off across the city the following morning.